expectations. Once you got here though, you fit in and made it yours, just like you had always been here. Your first and probably favorite find were the wading pools. Every trip out included a walk through all three pools for a drink of fresh water. You were the water nazi. If it wasn’t fresh, you haunted us until we made it fresh. Sometimes we didn’t always read the signals right and you got extra long ear scritches. But in the end, you made sure we changed out your water even if it meant 20 times a day, you always got fresh water. You loved trancing in the trees, running with your friends, eating apples, digging holes and lying in them, and stalking the cats just outside their room. You even became an honorary member of the United Federation of Cat Zappers. Once you got here, you always seemed so happy. You and Phoebe joined forces almost immediately and the Double-digit gang was started. Nobody wanted to mess with the Double-digit gang. You were older, wiser and automatically the bosses. From here forth, the Double-digit gang was always changing as you lost beloved members and new members joined. You were a wonderful ambassador to all of the newbies in the garden. Without you, many of the greyhounds might have missed out on the finer things in life. Many a new hole got dug after you introduced them to the dirt under the trees. You taught them about wading in the pools and enjoying a drink of fresh water. And no matter which dogs you with, you were everyone’s friend. One day, very excitedly I might add, you and Phoebe chartered the very first Red Hat Ladies club for greyhounds. You called yourself the “Red Hot Houndies”. Oneco, you were simply stunning in your red and purple bonnet. Even though Phoebe was the Grand Dame forever, you always were and will be one of the top dawgs. And even in your very final days, you loved wading and drinking from the pools. But the day came. 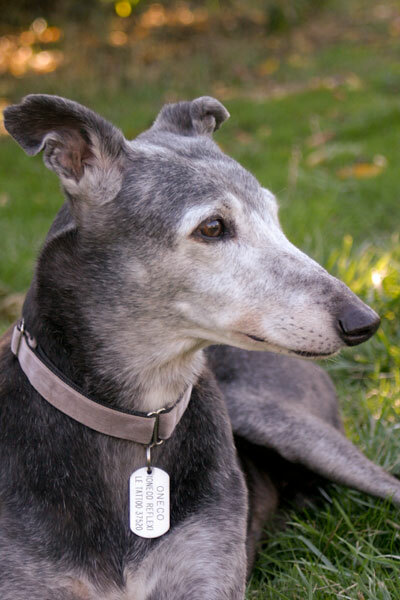 You had been a beautiful greyhound for almost 14 1/2 years, ran 95 good races and gave birth to 21 babies. You were tired and we knew it was time to say good-bye. You brought many of our greatest joys and we loved you so very much. Thank you, our sweet, sweet little Oneco ala Bear.